2015-05-08 Assigned to KEMIRA OYJ reassignment KEMIRA OYJ ASSIGNMENT OF ASSIGNORS INTEREST (SEE DOCUMENT FOR DETAILS). Assignors: AKZO NOBEL N.V.
A process for sizing paper comprising adding to an aqueous suspension containing cellulosic fibres, and optional fillers, a sizing dispersion comprising a polymer having an aromatic group, and a sizing promoter comprising a polymer having an aromatic group, wherein the sizing dispersion and the sizing promoter are added separately to the aqueous suspension. The sizing agent comprised in the dispersion of the present process added to the suspension is suitably any sizing agent known, such as non-cellulose-reactive agents including rosins, e.g. fortified and/or esterified rosins, waxes, fatty acids and resin acid derivatives, e.g. 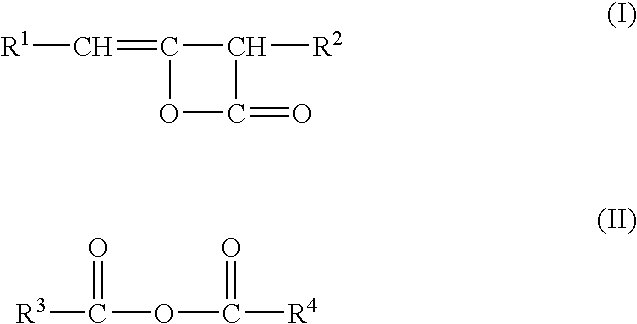 fatty amides and fatty esters, e.g. glycerol triesters of natural fatty acids, and/or cellulose-reactive agents. Preferably, the sizing dispersion contains cellulose-reactive sizing agents. The cellulose-reactive sizing agents comprised in the sizing dispersion can be selected from any cellulose-reactive agents known in the art. Suitably, the sizing agent is selected from hydrophobic ketene dimers, ketene multimers, acid anhydrides, organic isocyanates, carbamoyl chlorides and mixtures thereof, preferably ketene dimers and acid anhydrides, most preferably ketene dimers. Suitable ketene dimers have the general formula (I) below, wherein R 1 and R2 represent saturated or unsaturated hydrocarbon groups, usually saturated hydrocarbons, the hydrocarbon groups suitably having from 8 to 36 carbon atoms, usually being straight or branched chain alkyl groups having 12 to 20 carbon atoms, such as hexadecyl and octadecyl groups. The ketene dimers may be liquid at ambient temperature, i.e. at 25° C., suitably at 20° C. Commonly, acid anhydrides can be characterized by the general formula (II) below, wherein R3 and R4 can be identical or different and represent saturated or unsaturated hydrocarbon groups suitably containing from 8 to 30 carbon atoms, or R3 and R4 together with the —C—O—C— moiety can form a 5 to 6 membered ring, optionally being further substituted with hydrocarbon groups containing up to 30 carbon atoms. Examples of acid anhydrides which are used commercially include alkyl and alkenyl succinic anhydrides and particularly isooctadecenyl succinic anhydride. wherein R 1 is H or CH3; R2 and R3 are each an alkyl group having from 1 to 3 carbon atoms, A1 is O or NH, B1 is an alkylene group having from 2 to 8 carbon atoms or a hydroxy propylene group, Q is a substituent containing an aromatic group, and X− is an anionic counterion; and an anionic polymer having one aromatic group being a step-growth polymer, a polysaccharide or a naturally occurring aromatic polymer. wherein P is a residue of a polysaccharide; A is a chain of atoms comprising C and H atoms attaching N to the polysaccharide residue, R 1 and R2 are each H or a hydrocarbon group, R3 is an aromatic hydrocarbon group, n is an integer from 2 up to 300000, and X− is an anionic counter ion, and an anionic polymer having aromatic groups being a step-growth polymer, a polysaccharide or a naturally occurring aromatic polymer, wherein the sizing dispersion and the sizing promoter are added separately to the aqueous suspension. wherein R 1 is H or CH3; R2 and R3 are each an alkyl group having from 1 to 3 carbon atoms, A1 is O or NH, B1 is an alkylene group having from 2 to 8 carbon atoms or a hydroxy propylene group, Q is a substituent containing an aromatic group, and X− is an anionic counterion, and further an anionic polymer having an aromatic group selected from step-growth polymers, polysaccharides and naturally occurring aromatic polymers, wherein the sizing dispersion and the sizing promoter are added separately to the aqueous suspension. wherein P is a residue of a polysaccharide; A is a group attaching N to the polysaccharide residue, suitably a chain of atoms comprising C and H atoms, and optionally O and/or N atoms, usually an alkylene group with from 2 to 18 and suitably 2 to 8 carbon atoms, optionally interrupted or substituted by one or more heteroatoms, e.g. O or N, e.g. an alkyleneoxy group or hydroxy propylene group (—CH 2—CH(OH)—CH2—); R1 and R2 are each H or, preferably, a hydrocarbon group, suitably alkyl, having from 1 to 3 carbon atoms, suitably 1 or 2 carbon atoms; R3 is suitably an aromatic hydrocarbon group including aralkyl groups, e.g. benzyl and phenylethyl groups; n is an integer from about 2 to about 300,000, suitably from 5 to 200,000 and preferably from 6 to 125,000 or, alternatively, R1, R2 and R3 together with N form a aromatic group containing from 5 to 12 carbon atoms; and X− is an anionic counterion, usually a halide like chloride. The aromatic group modified cationic polysaccharide can have a degree of substitution varying over a wide range; the degree of cationic substitution (DS C) can be from 0.01 to 0.5, suitably from 0.02 to 0.3, preferably from 0.025 to 0.2, the degree of aromatic substitution (DSAr) can be from from 0.01 to 0.5, suitably from 0.02 to 0.3, preferably from 0.025 to 0.2, and the degree of anionic substitution (DSA) can be from 0 to 0.2, suitably from 0 to 0.1, preferably from 0 to 0.05. According to yet another preferred embodiment the cationic organic polymer is selected from homopolymers and coplymers prepared from one or more monomers comprising at least one monomer having an aromatic group, suitably an ethylenically unsaturated monomer. The cationic polymer may be branched linear or branched. The aromatic group of the cationic polymer can be present in the polymer backbone or, preferably, it can be a pendant group attached to or extending from the polymer backbone or be present in a pendent group that is attached to or extending from polymer backbone. Suitable aromatic (aryl) groups include those comprising a phenyl group, optionally substituted, a phenylene group, optionally substituted, and a naphthyl group, optionally substituted, for example groups having the general formulae —C 6H5, —C6H4—, —C6H3—, and —C6H2—, e.g. in the form of phenylene (—C6H4—), xylylene (—CH2—C6H4—CH2—), phenyl (—C6H5), benzyl (—CH2—C6H5), phenethyl (—CH2CH2—C6H5), and substituted phenyl (for example —C6H4—Y, —C6H3Y2, and —C6H2Y3) where one or more substituents (Y) attached to the phenyl ring can be selected from hydroxyl, halides, e.g. chloride, nitro, and hydrocarbon groups having from 1 to 4 carbon atoms. wherein R 1 is H or CH3; R2 and R3 are each or, preferably, an alkyl group having from 1 to 3 carbon atoms, usually 1 to 2 carbon atoms; A1 is O or NH; B1 is an alkylene group having from 2 to 8 carbon atoms, suitably from 2 to 4 carbon atoms, or a hydroxy propylene group; Q is a substituent containing an aromatic group, suitably a phenyl or substituted phenyl group, which can be attached to the nitrogen by means of an alkylene group usually having from 1 to 3 carbon atoms, suitably 1 to 2 carbon atoms, and preferably Q is a benzyl group (—CH2—C6H5); and X− is an anionic counterion, usually a halide like chloride. Examples of suitable monomers represented by the general formula (II) include quaternary monomers obtained by treating dialkylaminoalkyl (meth)acrylates, e.g. dimethylaminoethyl (meth)acrylate, diethylaminoethyl (meth)acrylate and dimethylaminohydroxypropyl (meth)acrylate, and dialkylaminoalkyl (meth)acrylamides, e.g. dimethylaminoethyl (meth)acrylamide, diethylaminoethyl (meth)acrylamide, dimethylaminopropyl (meth)acrylamide, and diethylaminopropyl (meth)acrylamide, with benzyl chloride. Preferred cationic monomers of the general formula (II) include dimethylaminoethylacrylate benzyl chloride quaternary salt and dimethylaminoethylmethacrylate benzyl chloride quaternary salt. wherein R 4 is H or CH3; R5 and R6 are each H or a hydrocarbon group, suitably alkyl, having from 1 to 6, suitably from 1 to 4 and usually from 1 to 2 carbon atoms; A2 is O or NH; B2 is an alkylene group of from 2 to 8 carbon atoms, suitably from 2 to 4 carbon atoms, or a hydroxy propylene group or, alternatively, A and B are both nothing whereby there is a single bond between C and N (O═C—NR5R6). Examples of suitable copolymerizable monomers of this type include (meth)acrylamide; acrylamide-based monomers like N-alkyl (meth)acrylamides and N,N-dialkyl (meth)acrylamides, e.g. N-n-propylacrylamide, N-isopropyl (meth)acrylamide, N-n-butyl (meth)acrylamide, N-isobutyl (meth)acrylamide and N-t-butyl (meth)acrylamide; and dialkylaminoalkyl (meth)acrylamides, e.g. dimethylaminoethyl (meth)acrylamide, diethylaminoethyl (meth)acrylamide, dimethylaminopropyl (meth)acrylamide and diethylaminopropyl (meth)acrylamide; acrylate-based monomers like dialkylaminoalkyl (meth)acrylates, e.g. dimethylaminoethyl (meth)acrylate, diethylaminoethyl (meth)acrylate, t-butylaminoethyl (meth)acrylate and dimethylaminohydroxypropyl acrylate; and vinylamides, e.g. N-vinylformamide and N-vinylacetamide. Preferred copolymerizable non-ionic monomers include acrylamide and methacrylamide, i.e. (meth)acrylamide, and the main polymer is preferably an acrylamide-based polymer. wherein R 7 is H or CH3; R8, R9 and R10 are each H or, preferably, a hydrocarbon group, suitably alkyl, having from 1 to 3 carbon atoms, usually 1 to 2 carbon atoms; A3 is O or NH; B3 is an alkylene group of from 2 to 4 carbon atoms, suitably from 2 to 4 carbon atoms, or a hydroxy propylene group, and X− is an anionic counterion, usually methylsulphate or a halide like chloride. Examples of suitable cationic copolymerizable monomers include acid addition salts and quaternary ammonium salts of the dialkylaminoalkyl (meth)acrylates and dialkylaminoalkyl (meth)acrylamides mentioned above, usually prepared using acids like HCl, H2SO4, etc., or quaternizing agents like methyl chloride, dimethyl sulphate, etc. ; and diallyldimethylammonium chloride. Preferred copolymerizable cationic monomers include dimethylaminoethyl (meth)acrylate methyl chloride quaternary salt and diallyldimethylammonium chloride. Copolymerizable anionic monomers like acrylic acid, methacrylic acid, various sulfonated vinyl addition monomers, etc. can also be employed and, preferably, in minor amounts. The anionic polymer can have a degree of anionic substitution (DS A) varying over a wide range dependent on, inter alia, the type of polymer used; DSA is usually from 0.01 to 2.0, suitably from 0.02 to 1.8 and preferably from 0.025 to 1.5; and the degree of aromatic substitution (DSQ) can be from 0.001 to 1.0, usually from 0.01 to 0.8, suitably from 0.02 to 0.7 and preferably from 0.025 to 0.5. In case the anionic polymer contains cationic groups, the degree of cationic substitution (DSC) can be, for example, from 0 to 0.2, suitably from 0 to 0.1 and preferably from 0 to 0.05, the anionic polymer having an overall anionic charge. Usually the anionic charge density of the anionic polymer is within the range of from 0.1 to 6.0 meqv/g of dry polymer, suitably from 0.5 to 5.0 and preferably from 1.0 to 4.0. The process of the invention is preferably used in the manufacture of paper from a suspension containing cellulosic fibers, and optional fillers, having a high conductivity. Usually, the conductivity of the stock is at least 0.20 mS/cm, suitably at least 0.5 mS/cm, preferably at least 3.5 mS/cm. Very good sizing results have been observed at conductivity levels above 5.0 mS/cm and even above 7.5 mS/cm. Conductivity can be measured by standard equipment such as, for example a WTW LF 539 instrument supplied by Christian Berner. The values referred to above are suitably determined by measuring the conductivity of the cellulosic suspension that is fed into or present in the headbox of the paper machine or, alternatively, by measuring the conductivity of white water obtained by dewatering the suspension. High conductivity levels mean high contents of salts (electrolytes), where the various salts can be based on mono-, di- and multivalent cations like alkali metals, e.g. Na + and K+, alkaline earths, e.g. Ca2+ and Mg2+, aluminium ions, e.g. Al3+, Al(OH)2+ and polyaluminium ions, and mono-, di- and multivalent anions like halides, e.g., Cl−, sulfates, e.g. SO4 2− and HSO4 −, carbonates, e.g. CO3 2− and HCO3 −, silicates and lower organic acids. The invention is particularly useful in the manufacture of paper from stocks having high contents of salts of di- and multivalent cations, and usually the cation content is at least 200 ppm, suitably at least 300 ppm and preferably at least 400 ppm. The salts can be derived from the cellulosic fibres and fillers used to form the stock, in particular in integrated mills where a concentrated aqueous fibre suspension from the pulp mill normally is mixed with water to form a dilute suspension suitable for paper manufacture in the paper mill. The salt may also be derived from various additives introduced into the stock, from the fresh water supplied to the process, or be added deliberately, etc. Further, the content of salts is usually higher in processes where white water is extensively recirculated, which may lead to considerable accumulation of salts in the water circulating in the process. In all examples hereinafter the sizing dispersion and the sizing promoter were added separately to the cellulosic suspension. Furthermore, in the case the promoter comprised more than one polymer having an aromatic group, these polymers were added separately to the suspension with respect to each other and to the dispersion. The furnish used was based on 80% by weight of bleached birch/pine (60/40) sulphate pulp and 20% by weight of CaCO 3 refined to 200 CSF and containing 0.3 g/litre stock Na2SO4, having a conductivity of 461 μS/cm and a pH of 8.1. An anionic sizing dispersion was prepared containing 8.9% of a commercial alkyl ketene dimer, 0.89% of an aromat substituted cationic starch having a DS of 0.065 containing benzyl groups, and 0.22% of condensated naphthalene sulphonate available under the trade name Tamol ®. The anionic dispersion was added in amounts of 0.0115% to 0.0140 (dry base, see table 3) based on the ketene dimer to a cellulosic suspension (dry base) containing 30% Pine, 30% Bee, 40% Eucaluptus, and 15% of precipitated CaCO 3. The conductivity of the suspension was 500 μS/cm. To the suspension was also added a sizing promoter containing benzyl substituted starch having a DS of 0.065 and condensated naphtalene sulphonate available under the trade name Tamol ® (test 2). To the same suspension was also added the same anionic dispersion. However, the sizing promoter added to the suspension contained no aromatic polymers. The sizing promoter contained cationic starch with a DS of 0.065 having no aromatic groups and anionic inorganic silica particles provided as a sol (test 1). The amounts of polymers of the promoter and sizing agent (AKD) of the dispersion are given in table 3. The furnish used was based on 80% birch/pine (60/40) sulphate pulp and 20% by weight of CaCO 3, refinded to 200 CSF and containing 0.3 g/litre stock giving a conductivity of 555 μS/cm and a pH 8.22.
forming and draining the obtained suspension, wherein the sizing dispersion and the sizing promoter are added separately to the aqueous suspension. 9. The process according to claim 8, wherein the first and second polymer of the sizing promoter are added separately to the aqueous suspension. 10. The process according to claim 8, wherein the sizing dispersion is anionic or cationic. 11. The process according to claim 8, wherein the sizing agent is a cellulose-reactive sizing agent. 12. The process according to claim 11, wherein the sizing agent is a ketene dimer or an acid anhydride. 13. The process according to claim 11, wherein the sizing agent is a ketene dimer. 14. The process according to claim 8, wherein the first and second polymer comprised in the sizing promoter are charged. 15. The process according to claim 8, wherein the net charge of the first and second polymer comprised in the sizing promoter are opposite. 17. The process according to claim 16, wherein the sizing dispersion is anionic or cationic. 18. The process according to claim 16, wherein the sizing agent is a cellulose-reactive sizing agent. 19. The process according to claim 18, wherein the sizing agent is a ketene dimer or an acid anhydride. 20. The process according to claim 18, wherein the sizing agent is a ketene dimer. 21. The process according to claim 16, wherein the cationic organic polymer of the sizing promoter is a cationic polysaccharide or a cationic vinyl addition polymer. 22. The process according to claim 16, wherein the cationic organic polymer of the promoter is a cationic polysaccharide. 23. The process according to claim 16, wherein the anionic polymer of the promoter is a step-growth polymer or a naturally occurring aromatic polymer. 24. The process according to claim 16, wherein the anionic polymer of the promoter is a naphthalene sulphonate condensation polymer or a modified lignin polymer. 25. The process according to claim 24, wherein the anionic polymer of the promoter is condensated naphthalene sulphonate or ligninsulphonate. wherein R1 is H or CH3; R2 and R3 are each an alkyl group having from 1 to 3 carbon atoms, Al is O or NH, B1 is an alkylene group having from 2 to 8 carbon atoms or a hydroxy propylene group, Q is a substituent containing an aromatic group, and X− is an anionic counterion. wherein P is a residue of a polysaccharide; A is a chain of atoms comprising C and H atoms attaching N to the polysaccharide residue, R1 and R2 are each H or a hydrocarbon group. R3 is an aromatic hydrocarbon group, n is an integer from 2 up to 300000, and X− is an anionic counter ion. 28. The process according to claim 27, wherein A is an alkylene group with from 2 to 18 carbon atoms, optionally interrupted or substituted by one or more heteroatoms; R1 and R2 are each H or an alkyl group having from 1 to 3 carbon atoms; R3 is a bezyl or phenylethyl group. 29. The process according to claim 16, wherein the cationic organic polymer and the anionic polymer comprised in the sizing promoter are added separately to the aqueous suspension. 30. The process according to claim 16, wherein the anionic polymer comprised in the sizing promoter is added to the aqueous suspension after both the sizing dispersion and the cationic organic polymer comprised in the sizing promoter. 31. The process according to claim 16, wherein the conductivity of the suspension is at least 3.5 mS/cm. 32. The process according to claim 31, wherein the conductivity of the suspension is at least 4.5 mS/cm. forming and draining the obtained suspension, wherein the sizing dispersion and the sizing promoter are added separately. 34. The process according to claim 33, wherein the cationic organic polymer is a cationic polysaccharide or a cationic vinyl addition polymer. 35. The process according to claim 33, wherein the cationic organic polymer is a cationic polysaccharide. wherein P is a residue of a polysaccharide; A is a chain of atoms comprising C and H atoms attaching N to the polysaccharide residue, R1 and R2 are each H or a hydrocarbon group, R3 is an aromatic hydrocarbon group, n is an integer from 2 up to 300000, and X− is an anionic counter ion. 38. The process according to claim 37, wherein A is an alkylene group with from 2 to 18 carbon atoms, optionally interrupted or substituted by one or more heteroatoms; R1 and R2 are each H or an alkyl group having from 1 to 3 carbon atoms; R3 is a bezyl or phenylethyl group. 39. The process according to claim 33, wherein the anionic polymer of the sizing dispersion and promoter is a step-growth polymer or a naturally occurring aromatic polymer. 40. The process according to claim 39, wherein the anionic polymer is a naphthalene sulphonate condensation polymer, a polystyrene sulphonate polymer or a modified lignin polymer. 41. The process according to claim 39, wherein the anionic polymer is a naphthalene sulphonate condensation polymer or a modified lignin polymer. 42. The process according to claim 39, wherein the anionic polymer is condensated naphthalene sulphonate or lignin sulphonate. 43. The process according to claim 33, wherein the cationic organic polymer and the anionic polymer comprised in the sizing promoter are added separately to the aqueous suspension. 44. The process according to claim 33, wherein the anionic polymer comprised in the sizing promoter is added to the aqueous suspension after both the sizing dispersion and the cationic organic polymer comprised in the sizing promoter. 45. The process according to claim 33, wherein the conductivity of the suspension is at least 3.5 mS/cm. 46. The process according to claim 45, wherein the conductivity of the suspension is at least 4.5 mS/cm. 47. The process according to claim 33, wherein the sizing agent is a cellulose-reactive sizing agent. 49. The process according to claim 48, wherein the cationic organic polymer of the sizing dispersion and promoter is a cationic polysaccharide or a cationic vinyl addition polymer. 50. The process according to claim 48, wherein the cationic organic polymer of the sizing dispersion and promoter is a cationic polysaccharide. 53. The process according to claim 52, wherein A is an alkylene group with from 2 to 18 carbon atoms, optionally interrupted or substituted by one or more heteroatoms; R1 and R2 are each H or an alkyl group having from 1 to 3 carbon atoms; R3 is a bezyl or phenylethyl group. 54. The process according to claim 48, wherein the anionic polymer of the sizing dispersion and promoter is a step-growth polymer or a naturally occurring aromatic polymer. 55. The process according to claim 54, wherein the anionic polymer is a naphthalene sulphonate condensation polymer, a polystyrene sulphonate polymer or a modified lignin polymer. 56. The process according to claim 54, wherein the anionic polymer is a naphthalene sulphonate condensation polymer or a modified lignin polymer. 57. The process according to claim 54, wherein the anionic polymer is condensated naphthalene sulphonate or lignin sulphonate. 58. The process according to claim 48, wherein the cationic organic polymer and the anionic polymer comprised in the sizing promoter are added separately to the aqueous suspension. 59. The process according to claim 48, wherein the anionic polymer comprised in the sizing promoter is added to the aqueous suspension after both the sizing dispersion and the cationic organic polymer comprised in the sizing promoter. 60. The process according to claim 48, wherein the conductivity of the suspension is at least 3.5 mS/cm. 61. The process according to claim 60, wherein the conductivity of the suspension is at least 4.5 mS/cm. 62. The process according to claim 48, wherein the sizing agent is a cellulose-reactive sizing agent. 65. The process according to claim 64, wherein A is an alkylene group with from 2 to 18 carbon atoms, optionally interrupted or substituted by one or more heteroatoms; R1 and R2 are each H or an alkyl group having from 1 to 3 carbon atoms; R3 is a bezyl or phenylethyl group. 66. The process according to claim 63, wherein the anionic polymer of the sizing dispersion and promoter is a naphthalene sulphonate condensation polymer or a modified lignin polymer. 67. The process according to claim 66, wherein the anionic polymer is condensated naphthalene sulphonate or lignin sulphonate. 68. The process according to claim 63, wherein the cationic organic polymer and the anionic polymer comprised in the sizing promoter are added separately to the aqueous suspension. 69. The process according to claim 63, wherein the anionic polymer comprised in the sizing promoter is added to the aqueous suspension after both the sizing dispersion and the cationic organic polymer comprised in the sizing promoter. 70. The process according to claim 63, wherein the conductivity of the suspension is at least 3.5 mS/cm. 71. The process according to claim 63, wherein the conductivity of the suspension is at least 4.5 mS/cm. 72. The process according to claim 63, wherein the sizing agent is a cellulose-reactive sizing agent. wherein P is a residue of a polysaccharide; A is a chain of atoms comprising C and H atoms attaching N to the polysaccharide residue, R1, and R2 are each H or a hydrocarbon group, R3 is an aromatic hydrocarbon group, n is an integer from 2 up to 300000, and X− is an anionic counter ion. 75. The process according to claim 74, wherein A is an alkylene group with from 2 to 18 carbon atoms, optionally interrupted or substituted by one or more heteroatoms; R1 and R2 are each H or an alkyl group having from 1 to 3 carbon atoms; R3 is a bezyl or phenylethyl group. 76. The process according to claim 73, wherein the anionic polymer of the sizing dispersion and promoter is a naphthalene sulphonate condensation polymer or a modified lignin polymer. 77. The process according to claim 76, wherein the anionic polymer is condensated naphthalene sulphonate or lignin sulphonate. 78. The process according to claim 73, wherein the cationic organic polymer and the anionic polymer comprised in the sizing promoter are added separately to the aqueous suspension. 79. The process according to claim 73, wherein the anionic polymer comprised in the sizing promoter is added to the aqueous suspension after both the sizing dispersion and the cationic organic polymer comprised in the sizing promoter. 80. The process according to claim 73, wherein the conductivity of the suspension is at least 4.5 mS/cm. 81. The process according to claim 73, wherein the sizing agent is a cellulose-reactive sizing agent. 83. The process according to claim 82, wherein the anionic polymer of the sizing dispersion and promoter is a naphthalene sulphonate condensation polymer or a modified lignin polymer. 84. The process according to claim 83, wherein the anionic polymer is condensated naphthalene sulphonate or lignin sulphonate. 85. The process according to claim 82, wherein the cationic organic polymer and the anionic polymer comprised in the sizing promoter are added separately to the aqueous suspension. 86. The process according to claim 82, wherein the anionic polymer comprised in the sizing promoter is added to the aqueous suspension after both the sizing dispersion and the cationic organic polymer comprised in the sizing promoter. 87. The process according to claim 82, wherein the conductivity of the suspension is at least 3.5 mS/cm. 88. The process according to claim 82, wherein the sizing agent is a cellulose-reactive sizing agent. 89. The process according to claim 82, wherein the sizing agent is present in the dispersion in an amount of from about 0.1 up to about 50% by weight based on total emulsion. 90. The process according to claim 82, wherein anionic polymer of the sizing dispersion is present in an amount of from about 0.1% up to about 15% by weight based on sizing agent. 92. The process according to claim 91, wherein the anionic polymer of the sizing dispersion and promoter is a naphthalene sulphonate condensation polymer or a modified lignin polymer. 93. The process according to claim 91, wherein the anionic polymer is condensated naphthalene sulphonate or lignin sulphonate. 94. The process according to claim 91, wherein the cationic organic polymer and the anionic polymer comprised in the sizing promoter are added separately to the aqueous suspension. 95. The process according to claim 91, wherein the anionic polymer comprised in the sizing promoter is added to the aqueous suspension after both the sizing dispersion and the cationic organic polymer comprised in the sizing promoter. 96. The process according to claim 91, wherein the conductivity of the suspension is at least 3.5 mS/cm. 97. The process according to claim 91, wherein the sizing agent is a cellulose-reactive sizing agent. 98. The process according to claim 91, wherein the sizing agent is present in the dispersion in an amount of from about 0.1 up to about 50% by weight based on total emulsion. 99. The process according to claim 91, wherein anionic polymer of the sizing dispersion is present in an amount of from about 0.1% up to about 15% by weight based on sizing agent. 100. The process according to claim 91, wherein cationic polymer of the sizing dispersion is present in an amount of from about 0.1% up to about 15% by weight based on sizing agent. PH31656A (en) 1994-02-04 1999-01-12 Allied Colloids Ltd Process for making paper.